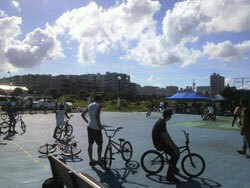 The Umikaze Jam took place last sunday in Yokosuka, Japan. It took place on a big outdoor spot and after some rain in the morning the sun came out and Moto took the first place! Congratulations! Check the official jam blog for further information in Japanese.